People showed up as much as two days early for a recent first come first served free dental clinic at the First Baptist Church in Rockhill, South Carolina. The sixth annual S.C. Dental Access Days clinic started at 6 a.m and ran through 3 p.m. for two days. Dale Dove of the Renew Our Community ministry said he helped to persuade the clinic to locate at Rock Hill because the need there was acute and it would not only address some of that need but also highlight the painful and health destroying gap between that need and access to dental care. Hundreds of dentists, hygienists, and suppliers joined with hundreds of local volunteers to stage the event which used 80 chairs to see approximately 1,500 people for all types of services. 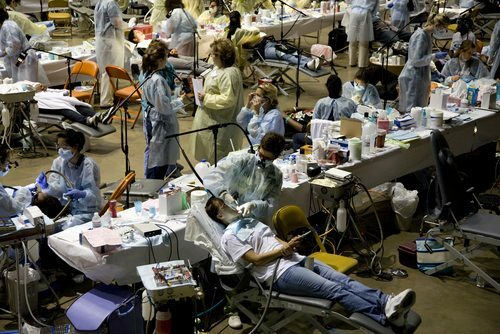 Meanwhile, in North Carolina the North Carolina Missions of Mercy will transform the Charlotte Convention Center into a marathon 36 hour free dental clinic on September 5th and its intention this year is to help 2,500 patients. They need to recruit 300 volunteer dentists and hygienists, and 200 medical volunteers to carry that event off, as well as a whole slew of lay volunteers. That event will be one of six put on by MOM in North Carolina this year. Mission of Mercy also offers free clinics in many other states including Oregon where at dawn on July 14th, there were already about 300 people lined up, some having waited for 24 hours. The first two in line were Kory Brown who needed a root canal and his wife Leslie Bowers who was hoping for a removable partial denture, to replace a dead tooth.